Swimming teachers help people of all ages and abilities to develop swimming skills and techniques, and to exercise in water. Swimming coaches train and develop competitive swimmers. keep up-to-date on developments in sports science. Why did you choose this profession? I was self-employed in a totally different industry, namely catering. I saw an opportunity to be involved with a profession that stirred a passion within me. I have not looked back and my passion for swimming has only grown stronger. What training did you undergo? 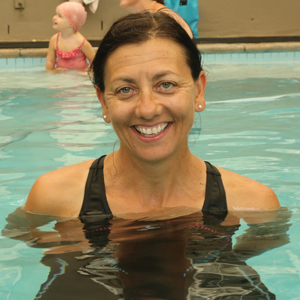 I am a qualified Level 1 swimming coach, swimming teacher and baby swimming facilitator. I underwent courses presented by the Professional Baby Swimming Teacher’s Association and Swim South Africa, as well as Aqua Aerobics presented by Elsa Storm Professional Aquatic Association of South Africa. Describe a typical day I facilitate baby swimming group lessons with parents and their babies. In the afternoons I hold private lessons for older children (age 3 to 5), either at my home-based pool or at a school in my area. I also coach swimming to children in grades 1 to 6 at the same school. Between these lessons I manage my business, dealing with clients, administration and different aspects that are related to the running of my business. What do you enjoy most? I am very passionate about swimming in general, but mostly enjoy seeing the children progress through the different levels and observing how their confidence is boosted as they achieve and grow stronger in their swimming practice. Swimming incorporates many different areas of growth and development that are often not seen or thought about initially. What don’t you like? I don’t like the pressure that is placed on children to perform; either by parents, swimming teachers or coaches. I believe in working at the child’s pace to make them comfortable in water and to encourage them to enjoy swimming for recreation, competitively or for fitness. Hurdles you’ve overcome? There are many swimming schools in my area and it has taken considerable time to build a reputation of being the school of choice, mainly through word of mouth from parent to parent. This has been the strongest advertising tool. Finding effective marketing tools that suit my business without the expertise required is a challenge; breaking mindsets of ‘end result’ versus long-term enjoyment of swimming. Your career highlights so far? Developing a vision for an aquatic centre, where developmental swimming would be the focus; reaching schools in the area that do not have swimming pools; working towards developing swimming as a sport of choice in South Africa. Experience vs formal training? Experience plays a very important role, as you learn that each individual is different and theory in practice is affected by this. Different folks = different strokes! In saying that, the theory, if applied correctly, is effective. What makes a good teacher? You need to have leadership capabilities, as well as a nurturing personality. You also need patience, and the ability to motivate and connect with children at their level of understanding and perseverance. Any advice for wannabe swimming coaches? Develop an understanding of the skill of swimming (swim yourself), obtain professional qualifications, and do ongoing training. Your job in three words Just keep swimming! Qualifications are an important aspect that should be taken seriously as a swimming teacher or coach. There is a range of formal qualifications and different stages to complete, but many teachers or coaches have also been competitive swimmers themselves when young, something which is an advantage when proving credentials and expertise.